Save and easily access your designs from anywhere. Select the colors that appear in your design. This helps us determine the pricing based on the number of colors in your design. Customize !- Ragland 3/4 Length Dry Weave Baseball Jersey online and get fast shipping. Try our Easy to use designer to add your artwork, photos, or text. Design something unique for yourself, school, company, tournament or team! No minimum quantity. Choose your product and customize it in minutes. Perfect for teams on a tight budget. Now you too can hit it out of the park and not break the bank. 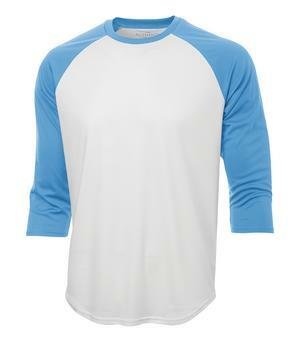 This sporty baseball jersey tee works well for both women and men. Please read and agree to the copyright terms. If you do not have the complete rights to this graphic, you are not allowed to upload it. Click image to add design. Send me the link to my Design! You have saved design. Do you want to replace it or enter a new design? Don't forget to save your design! We'll review everything! Centering, Positioning, pixelation, background removal...etc. Add CustomizationDepot to Home screen!